With roughly six weeks left in the regular season, let’s take a look at the current leaders in the race for the Conference Player of the Year awards. 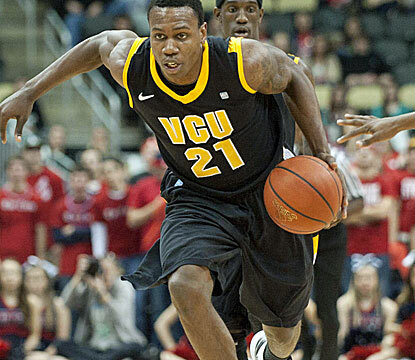 Current POY: Treveon Graham, VCU. Interesting but not surprising that this is currently a race between players from the two new A-10 powers, VCU and Butler. Graham gets the nod right now over Rotnei Clarke of Butler, but mostly just because Clarke has been out for the last couple of weeks with a neck injury (he returns today vs. Temple). Graham, just a sophomore, is a big guard averaging 16 points and 6 rebounds for the Rams. Other Contenders: Aside from Clarke, Temple’s Khalif Wyatt is second in the league in scoring, but needs to be more consistent. Graham’s VCU teammate, Juvonte Reddic, could definitely steal the award from him. Next Day Edit: After La Salle’s win at VCU, coming on the heels of a defeat of Butler, Ramon Galloway has put himself into the POY discussion. The senior guard from Philly went for 31 points vs. VCU, and is averaging 17 a game on the year. The Explorers are making a push for their first tournament appearance since 1992. Meanwhile, Clarke’s 24 points/9 assists in a defeat of Temple last night might have pushed him into the lead for POY in what will be a tight race to the finish. Current POY: Mason Plumlee, Duke. His performance has dropped off a bit lately, but he’s still the easy pick here. Leading the league in rebounding (11.4), second in scoring (17.3), and 4th in blocks for the 16-2 Blue Devils. Other Contenders: With a 5-0 start to league play, including the demolition of Duke a few days ago, Miami’s Durand Scott has to be in the 2nd spot for ACC POY, at the moment. The senior guard is the Canes leading scorer and third in the league in steals. NC State’s C.J. Leslie could end up in the conversation if the Wolfpack can put things together. Hard to imagine Seth Curry beating out his teammate, especially with the nagging leg injury, but it is a possibility. Current POY: Ben McLemore, Kansas. An interesting race here, but the nod goes to this freshman guard who some think will be the best NBA player to come out of Kansas since Paul Pierce. He’s an elite athlete with outstanding shooting ability. He’s second in the league at 16 points a game, shooting 45% from 3, for the 17-1 Jayhawks. Other Contenders: Kansas is the clear class of the league, so McLemore’s main competition is teammate Jeff Withey, who’s averaging 13 points/8 boards and is among the nation’s leaders with over 4 blocks a game. Two other intriguing candidates are Baylor’s Pierre Jackson (leading the league by a wide margin with 18.6 ppg) and Kansas St.’s Rodney McGruder, who’s been coming on strong after a somewhat slow start to his season. Current POY: Michael Carter-Williams, Syracuse. Not a big scorer (12 points a game), but he’s leading the nation in assists and is among the leaders in steals. He has the Orange in first place in the league and has hit some big shots and made some big plays in a couple of key wins. Other Contenders: Louisville’s Russ Smith is the main contender right now, with his 19 points a game for a team that could very well end up winning this league. Cincinnati’s Sean Kilpatrick is a good darkhorse candidate. Two guys that need to get their team’s winning consistently again to get back in the conversation are Notre Dame’s Jack Cooley and Georgetown’s Otto Porter. Current POY: Trey Burke, Michigan. The nation’s best conference also might have the best POY race, not surprisingly. Right now, Burke is a fairly easy choice, but that could definitely change. The sophomore point guard is third in the league in scoring (17.8 ppg), shooting over 50% from the field, and ranks first in assists by a wide margin (7.2 per game). Other Contenders: Ohio St.’s Deshaun Thomas (leading scorer at over 20 ppg) and Indiana’s Cody Zeller look like the main competition. Burke’s backcourt mate, Tim Hardaway Jr., and Indiana’s do-it-all guard Victor Oladipo could possibly overtake their more highly-touted teammates. And if Michigan State ends up stealing the league title, which is far from impossible, Keith Appling could have a case. Current POY: Doug McDermott, Creighton. When you’re the favorite for national POY and you play in a mid-major conference, that’s what we call a no-brainer pick. 24 points per game, 56% from the field, and 49% from 3. Quite simply the best scorer in the country by a wide margin, and his team 17-3. Other Contenders: Basically, there isn’t any. But the current 1st place team in the MVC is not McDermott’s squad, it’s actually Wichita State. They have two forwards, Cleanthony Early and Carl Hall, who’s names you just may hear in March. Current POY: Jamaal Franklin, San Diego St. You could make the argument that this is the second-best league in the country, and the POY race backs that up. Franklin will make a lot of money in the NBA. The 6-5 guard is second in the MWC in rebounds (9.6 per game), which gives some idea of his athleticism, as well as how hard he plays. He’s also averaging 18 points, which ranks third in the league. Other Contenders: UNLV’s Anthony Bennett may have hit the freshman wall a bit, with back-to-back single-digit scoring games last week, but he’s still averaging 18 points/9 boards on the year for a really good Rebels team. New Mexico guard Kendall Williams is the best player on what just might be the best team in this league, so his 14 points/4.6 assists per game have to have him in the discussion. Darkhorse candidates for under-the-radar solid teams: Boise St.’s Derrick Marks and Colorado St.’s Colton Iverson. Current POY: Shabazz Muhammad, UCLA. Some rated Muhammad as the top high school player in the country last year, but he was ineligible for the first couple weeks this season, and then he’s been underwhelming at times once he got on the court, with his team having some big struggles in non-conference play. Despite all that, here he is as the current leader for the league POY. The Bruins just had a win at Arizona, where Muhammad scored 23 points. He’s averaging 18 and shooting 47% from 3, and has his team 6-1 in league play. Other Contenders: Oregon is the lone undefeated team in league play, but they’ve been really balanced, with no stand-out player. That leaves a quartet of players from the other league contenders that could push Muhammad for POY: Arizona’s Mark Lyons, Washington’s C.J. Wilcox, Cal’s Allen Crabbe, and Arizona St.’s Jahii Carson. Current POY: Marshall Henderson, Ole Miss. Henderson is, by all accounts, a very odd dude that bounced from Utah to Texas Tech to junior college over the last few years. After winning JUCO National POY a year ago, he landed in the SEC, and he has Ole Miss contending for the first time in forever. A lot of that is because the SEC is just pretty bad this year, but Henderson the sharp-shooting and volatile Henderson is leading the league at over 19 points per game, and has the Rebels at 5-0 in league play. Other Contenders: It’s kind of a jumble of guys behind Henderson right now. Missouri’s Laurence Bowers seems like the best candidate to challenge him, but he needs to get healthy again. His teammate, Phil Pressey, has the talent but hasn’t been able to harness it all the time this year. Florida is the league’s best team, but it’s hard to see Kenny Boynton or Erik Murphy distinguishing themselves enough for the award. Finally, Arkansas’s BJ Young and Alabama’s Trevor Releford are having strong seasons for teams that aren’t great, but will contend in a weak conference. Current POY: Kelly Olynyk, Gonzaga. Coming into the season, no one would be surprised if a Gonzaga player took the POY award for the WCC, but few would have thought it would be Olynyk. After redshirting last year, just to work on his game, the 7-foot junior has been a dominant player for the Zags. And he keeps getting better as the season goes along: in conference play so far he’s averaging over 25 points a game, while shooting a mere 73% from the field. Other Contenders: St. Mary’s PG Matthew Dellavedova won this award last year, and if the Gaels can manage to win this league again, he would be in line to repeat as POY. BYU has two guys putting up big numbers: guard Tyler Haws (20.6 ppg) and forward Brandon Davies (18 points/7 rebounds), but unless they can rise up out of the 3rd place position, they’ll likely have to settle for spots on the All-Conference team but not grab POY. It’s conceivable that Olynyk’s teammate, Elias Harris, could take it, but considering the way Olynyk has been improving as the season goes along, it seems very unlikely. It is another solid slate tonight, and I have picked out 10 games most on my radar around the country. The Game of the Night tonight is in Spokane. I honestly think this is the best Gonzaga team of all-time, and it very well could be one of the best St. Mary’s teams, as well. Matthew Dellavadova is one of the best players that no one has ever heard of. But, this Zags team is absolutely loaded, and this is not the last time you will hear me say this, but they are a legitimate national title contender. They are that good. A little homerism in me here giving this one second-billing, but it is opening night in a brutal A-10 for the Owls and it is on the road against one of their most bitter rivals. The Musketeers are in a rebuilding year, but that does not mean they are not very dangerous. This is one of the bigger games on the schedule for the Owls, especially because a lot of momentum can be gained or lost with the conference opener. As my homerism for Temple gave them second-billing, my affinity for the low-major conferences gives this one third-billing. But, trust me, while these teams “national relevance” will all depend upon their play in the A-Sun tournament, this is a pretty huge game for anyone who has any interest in Atlantic Sun basketball. With the possible exception of Mercer (who did lose a head-scratcher to Kennessaw State last week), these two teams are head and shoulders above the rest of the league this year. They are two programs that are enjoying D-I success for pretty much the first time, and their rosters have been built for this year. So, at the risk of sounding overdramatic, this could one of the bigger games in the history of these two programs, as they are both at the top of the standings of a league where one of them will likely win. Spartanburg will be buzzing tonight. Okay, okay, it is time to get to the “important” conferences. This is the biggest battle of “rich” teams tonight, as the undefeated Wildcats travel to Eugene for their biggest road test yet this year. Dana Altman’s Ducks are way ahead of schedule on their rebuild and really might contend this year. A win tonight would go a long way in determining that. Philly’s own Fran McCaffery has the Hawkeyes back to Big Ten relevancy – now it is time to grab some national attention, which a win over Sparty would certainly do. However, Tom Izzo’s boys are coming off of a drubbing of Purdue and are still undervalued on the national scene. They will – as always – be heard from come March. What is going on in Chapel Hill? A bad noncon led into a 9-point loss at UVa to open the ACC schedule. Now, the Heels return home to the Dean Dome really needing a W against a pretty tough opponent. The injury to Miami’s Reggie Jackson makes them look more like a tenuous bubble team than a potential Sweet 16 contender, but there is still talent there, and the Heels better watch out. Youngstown State has been one of the many pleasant surprises from the Horizon this year, but now they have to bring it into league play. They split their first two league games – both on the road – and now they will get a real test from Ray McCallum and the Titans, who may just be smelling blood in the Horizon waters with the Valpo home loss to Loyola (IL) to kick off league play. Detroit is 2-0 with a couple of home wins in the league, but now they get to show themselves with a tough road test. There is a real chance that Stephen F. Austin is simply too good and will run away with the Southland title this year. But, if that doesn’t happen, one of these two teams will be the team that runs them down. Clearly the 2nd and 3rd best teams in the league this year, NW State and ORU are both chasing the Lumberjacks and both will need wins like these to catch them. ORU has opened their first SL season with a couple of good road wins, while NW State has two home wins, but two dominating home wins. This could tell us a lot about both teams. Oakland was supposed to be in a rebuilding year, while the Jackrabbits of South Dakota State were supposed to run away and hide with the Summit League this year on the back of future NBA’er, Nate Wolters. Well, things don’t always go as planned, as Oakland had a very good noncon and has started 2-1 in league play. The Jackrabbits, on the other hand, struggled though an admittedly tough noncon schedule, but have brought those struggles into the league, particularly their last game – a 3-point loss in the Thunderdome against an inferior South Dakota team. Time to right the ship for SD State or they might have trouble catching this Oakland team for 3rd-place, let along tracking down North Dakota State and Western Illinois in the top two spots. The NEC is totally upside-down. Bryant is on top, while the two preseason favorites, Robert Morris and Long Island, would not even make the NEC tournament as it stands now. At least Wagner seems to have righted their wobbly noncon ship to grab a couple of wins to start league play. LIU – who is absolutely loaded and has no excuse for their 5-9 start and 0-2 in league play – is desperate. Meddle will be tested tonight on Staten Island. Great slate of games tonight. Here are a couple of my favorites. The Gophers actually look like they might be a legit Final Four contender. The Illini are needing to prove that they are the team that people thought they were with their terrific noncon slate. The Illini lost to Purdue, but beat Ohio State in Big Ten action, while the Gophers pounded both Michigan State and Northwestern at home, but this is their first league test on the road. The second or third best conference in America – if you are asking me – opens up tonight with four really good MVC games. UNLV in The Pit, though, is the cream of the crop. A true Sweet 16-caliber matchup to open up the Mountain West is not an exaggeration…trust me, this is the best game of the night. The most unlikely of undefeateds, the Cowboys of Wyoming, who are awfully tough at home, host a Boise State team that looks every bit of an at-large tournament team. This game could have wide-reaching ramifications come Selection Sunday. The last two Big XII teams to open their conference slates do so tonight in Lawrence. The Jayhawks are the clear conference favorites and really tough at home, but the Cyclones are one of the more likely teams – if anyone can – to pose a challenge to KU’s supremacy. To win in the Fogg, though, is not exactly an easy task. It is rather early to be calling anything an “elimination game,” and I am not doing that here, but let us just say that these two teams have drastically underachieved thus far, including each losing their conference opener, so it is as close to a “gotta have it” kind of game as there is on January 9th – especially for West Virginia, who lost by 10 points at home to a rebuilding Oklahoma on Saturday. In a historically bad SEC, it is anyone’s guess as to who the 4th-best team is. If you ask me, I would say that it is probably a toss-up between these two teams. And, I do think that the league should be good enough (or reputationally good enough) to get at least 4 bids, so this game could carry a lot of weight in two months. As a lifelong fan of the conference, this should be – by far – the most fascinating season in the history of the Atlantic 10. And, tipoff is tonight. Most conference games all year will be fascinating, but there are two that really jump off of tonight’s slate. Dayton travelling to league rookie – and league favorite – VCU should be really good…if the Dayton guards can deal with the VCU pressure. If not, this could be quite the opening statement from one of the two new members. The other rookie goes on the road to one of the original A-10 teams – St. Joe’s. The Bulldogs have won 9 in a row, including a shocker over #1 Indiana, but they open the conference schedule against Phil Martelli’s squad, who was the preseason pick to win the league. The Hawks have been somewhat disappointing throughout the noncon, but that is no reason to count them out from A-10 contention, as their talent can matchup with just about anyone in the league. While Bradley-Indiana State is also interesting tonight in the MVC, I will be more focused on this game because I still think that UNI might have the best pieces to mount a challenge at league favorite, Creighton. But, they already have 2 league losses, including a 25-point beatdown at the hands of Wichita State. And, Evansville is no slouch and could be a true sleeper in this league race – if they can win a couple road games. Generally, C-USA is going to be only interesting in its awfulness, but these two teams have an outside shot at minor national relevance. Tulane is very under-the-radar, but very solid, and UTEP, who was written off after a 1-4 start, actually has looked really solid against a much tougher schedule than people seem to realize. They have beaten Oregon and New Mexico State, as well as 16- and 20-point wins over Nebraska and Oral Roberts, respectively. They also have tough losses against Arizona, UNLV, Oklahoma, Clemson, and Colorado State. If there is a C-USA sleeper, it might be the Miners. Everyone’s preseason pick – Valpo – travels to Chicago to face the nation’s biggest surprise so far, UIC. The Flames of UIC were supposed to muddle through another dreaful season in the Windy City, but had a 8-game winning streak in November and December that included wins over Mercer, Iona, Nortwestern, and Colorado State. They dropped off a bit at the end of the noncon schedule, but they did beat Youngstown State to open conference play before losing at Cleveland State. Valpo rebounded off of a head-scratching home loss to Loyola-Chicago to start conference play with a trouncing of Cleveland State. This is an interesting litmus test for both teams as we get into the meat of the Horizon schedule. The Big West has gone from one of the most boring leagues to one of the most intriguing, seemingly overnight. Hawaii currently sits atop the league at 3-0, but they have yet to leave the Islands for a league game…until tonight. They go to visit the Anteaters, who, after a stunning noncon that established them as true favorites to win this league, they have actually struggled in the early going – beating UC-Davis in OT before dropping back-to-back road games at UCSB and Cal Poly. Tonight’s game will start to show us if Hawaii has what it takes to win on the road in this league and/or if UC-Irvine is as legit as their noncon would suggest them to be. The two most surprising of CAA contenders face off tonight, as the Tribe tries to rebound off of a tough loss to George Mason over the weekend, while Towson tries to build upon a terrific 2-0 start to conference play with a pair of really good road wins, including a win over preseason-favorite, Drexel, on Saturday. Towson is ineligible for the CAA tournament, so they are just playing for pride and a banner in their final year in the Colonial. The story of the noncon in the OVC was not Isaiah Caanan and Murray State or even the incredible numbers that Belmont is putting up in crushing opponents. The story was – “what is going on with that EKU team?” The Colonels won their first 9 games before a close loss at Illinois ended their perfection. Everyone thought (and probably still thinks – as do I) that the OVC is really just a two-team battle between Murray and Belmont, but EKU has earned a place in that discussion so far and will almost assure themselves season-long relevancy with a win tonight in Murray. But, even me – an EKU believer – does not see that happening. Typically light Tuesday night slate around the country, as we await the kickoffs of the final conference schedules, but there are four games that caught my eye, for various reasons tonight. Everyone was raving about Pitt after cruising through a cupcake non-conference slate, but they have opened Big East play with a home loss to Cincinnati and another loss at Rutgers over the weekend. Now, they go to DC to play a tough Georgetown team that is also seeking its first league win, after only managin 48 points in one-point loss at Marquette on Saturday in their Big East opener. This will probably be ugly, but important. The 2013 SEC tipoff – the only conference game on the slate on the first night of conference play. The non-conference season really illuminated what some may have feared about the SEC – it really is not very good. In a 14-team league, there are really only three legitimately good teams, as questions marks surround teams like Tennessee, Arkansas, Ole Miss, and even Anthony Grant’s Crimson Tide, who travels to Missouri tonight to take on one of those three “legitimate” teams. The Tigers will be welcoming ‘Bama to mark their first ever SEC game, hoping to write the first chapter in their first ever SEC championship. ‘Bama did themselves no favors in the noncon and will really have to turn heads in conference play to put themselves back in the tournament discussion. That head-turning could start tonight. I still believe that Illinois State is the second-best team in a very good Valley this year. However, the Redbirds are testing my resolve, as they have opened conference play with three straight losses, including two at home – most recently a 10-point home loss to UNI. Missouri State is in pretty much the opposite position – having had a dreadfully forgettable non-conference season that has made their excellent conference start shocking. The Bears opened Valley play with an 11-point win over S.Illinois, followed by a tough OT loss at Evansville and then a 12-point road win at Drake on Saturday. If the Bears can take care of business tonight at home, we may have to start looking differently at our Valley projections. Without VCU in the conference any more, the Drexel Dragons were supposed to run away and hide with the CAA this year. Throw in the total rebuilding years at Old Dominion and Hofstra, a minor rebuild at George Mason, and the return of most of a Dragon team that won 29 games last year and the only question was supposed to be whether or not they would even lose a game in this league. Well, they did – at home – to Towson. The culmination of a stomach-punchingly disappointing non-conference slate was the home loss to lowly Towson on Saturday. Now, they either have to continue their freefall or figure out a way to fix what is wrong – and fast. Tonight would be a good time to start, as the Dragons host the conference’s other (aside from those Towson Tigers) 2-0 team, Northeastern. The Huskies had a surprisingly solid noncon and opened conference play with a huge road upset of George Mason. They followed that up with a home win over UNC-Wilmington on Saturday and seem poised and ready to come to Philly for a shot at the preseason favorites. If you know anything about BSB, you know that we like to play make things interesting with our little parlor games. Well, here is one that has gone really well since it debuted in 2010. It’s an NFL Playoff Challenge, and anyone is welcome to join, if they so please. You assign each playoff team a “weight” (1 – 12, with 12 being the “most confident”) of how confident you have of them going far in the playoffs. For each playoff win, you will receive the amount of points that you have that team weighted. For instance, if I feel most confident in the Patriots, I would give them the 12, and I would get 12 points for every playoff game they win. There’s a bit of a catch here in that a bye gives you nothing, so there may be some advantage to giving a high weight to one of the 8 teams playing this week because they will play an extra game. But, then again, they will then be on the road next week, if they win. Points for the Championship Games will be doubled, and points for the Super Bowl will be tripled. This makes it so the Championship Game round is just as important as the other rounds, even though there are fewer games, and the Super Bowl pick is the most important single pick. Feel free to join us in the Challenge, if you want. You can post your picks on the comment here or email me or Doogan. We will update the standings after each round and have even partnered with the greatest pool administation site on the web, www.grza.com, so we will be able to follow the pool there, as well. There will likely be some “side action” on the pool, as well, so we’ve got that goin’ for us, too…which is nice.